AVENGERS: INFINITY WAR: Starring Robert Downey Jnr, Chris Hemsworth, Mark Ruffalo, Chris Pratt, Scarlett Johansson. Directed by Anthony Russo and Joe Russo. Rated M (Fantasy themes and violence) 156 minutes. WITH such heavy anticipation and expectation, Marvel Studios delivers again with an astounding culmination of a 10-year lead-up. Avengers: Infinity Wars goes straight to the deep end, breaking the rules. It is sure to leave viewers somewhat gobsmacked so be prepared for an explosive 149 minutes. After the innovation and freshness of Thor: Ragnarok and Black Panther, both MCU (Marvel Cinematic Universe) films leaving an impression and raising the bar high for the franchise, it was very clear that directors Joe and Anthony Russo would have a gargantuan task ahead in creating the most quintessential product yet. There have been so many fan-inspired questions and theories about the unmanageable number of characters, the roles of their favourite heroes and the outcome of the over-arching story. Let me say first up that the production team did not buckle under the pressure. 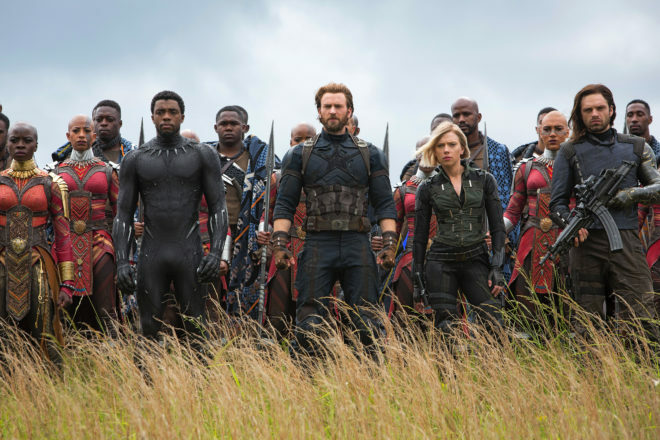 The picture opens with a sombre rendition of the Avengers theme indicating the seriousness of the events that are about to ensue and, soon after, it takes a deep dive into the continuation of a previous after-credit scene. There is no mucking around here, things are real and the main antagonist Thanos (Josh Brolin) shows every intent in his quest of gathering all Infinity Stones. No set-up is required, neither is any origin story so viewers are thrown into the thick of it therefore anything that is mentioned beyond the opening credit is a possible spoiler. Beware of the Internet if you are to heed this advice. What can be said is that Thanos is revealed in his fullest stature, armed with his lieutenants (the Black Order) who are more than capable at matching Earth’s mightiest heroes. Unleashing the Black Order is one of the film’s strong points; all four members having their individual battles with at least one major hero, all unique, entertaining and even-matched. What’s even more interesting is that the narrative focuses in on Thanos’ story, giving the audience a glimpse into the why behind his quest and the way in which he has gone about doing things in the past (like decimating entire planets). At one point, one may even feel a little bit sorry for the Titan but there isn’t enough substance to sustain this “softer” side of the film. Aside from this, the lens widens as the Russo brothers aim to capture this gigantic all-in battle for the survival of the universe. What it means is the reduced focus on individual characters with their screen time consisting mostly of battle scenes and witty interactions between heroes. The smack talk between Raccoon, Thor, Doctor Strange, Spider-Man and Ironman are all absolute winners and brings in a much-needed balance of humour amidst the serious tone. Even some of the one-liners by minor players such as Okoye (Black Panther) and Wong (Doctor Strange) make sure that every character has a moment in the spotlight – a task that was always going to be tough. Kudos to the Russo brothers on this one. Running at a whopping 2 hours and 40 minutes, there is never a dull moment in Avengers: Infinity Wars, with every minute contributing to the impending doom of the universe. Blink and you’ll most certainly miss something, such is the density of his film. This density is intensified in the film’s final act with an ending that is shocking and haunting, leaving major ripple effects in the entire Marvel cinematic universe. While it’s great that Marvel didn’t do the same old thing with its ending, it also took a lot of weight off the rest of the movie, finishing the proceedings in an anti-climactic fashion that will surely get the fans talking. Could it be what Marvel Studios is trying to achieve? Marvel Studios also reverts back to its old ways by dropping a couple of Easter eggs that allude to what fans may expect to see in the future, a move that is now cheesy and boring. As previously announced, this is a two-part film with the sequel yet to be named for fear of spoilers, so it’s clear that there is some unfinished business in Avengers: Infinity Wars. Therein lies another weakness; trading in a wholesome story for the sake of marketing. What turns out to be an incomplete two-part story could have genuinely worked as a stand-alone film with fewer characters and density. As per every other superhero picture that is part of a larger cinematic world, there is a lot of previous knowledge that is assumed of the audience meaning that one can’t simply walk into a movie theatre without having chewed into a major chunk of the Marvel films. In the end, Avengers: Infinity Wars actually manages to achieve what it aimed to do, which is to create an ultimate showdown between the over-arching villain and the heroes, rounding up snippets of each character’s world. It is a dark and satisfying superhero flick that stands uniquely in the cinematic world, the first of its kind and not the last.